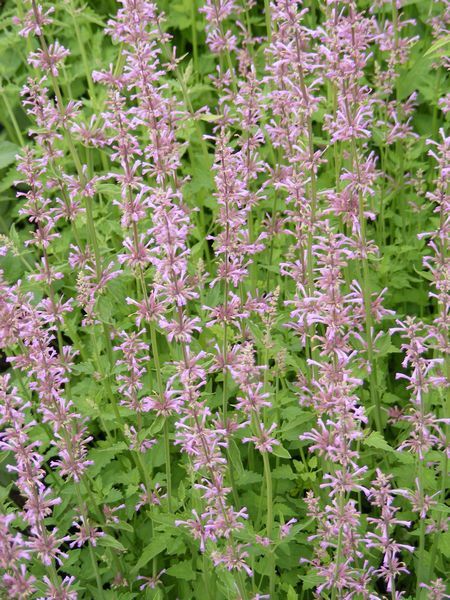 Compact fragrant perennial with an upright habit - can grow up to 50cm. 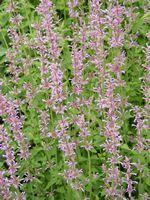 Has well-branched stems, aromatic, ovate, grey-green leaves and bears whorls of fragrant soft pink tubular flowers on erect, terminal, salvia-like spikes. Easily grown in average, medium moisture, well-drained soils - will not tolerate heavy clay soil. Prefers full sun, but will do well in hot areas with a bit of afternoon shade. Drought and heat tolerant once established. May be grown as an annual and is a vigorous re-bloomer if deadheaded. Good for rock gardens, flower borders, cottage gardens, herb gardens, butterfly gardens and large containers. The foliage has a spicy scent and the flowers are also spicy flavored, making them useful as garnish in salads. The leaves have been used for seasoning meats by the Pueblo Indians. Has potential homeopathic use for treatment of fever and coughs. Attractive to sunbirds, bees and butterflies.